The Inspiration : The Road Less Travelled - Dr Bhagat Ram Sahgal. Following is a short biography of the man who had a vision in mind, a vision to secure the future of the children of this noble country by doing his bit. His contribution to the society cannot be measured but can be only felt by the thousands who had the privilege to be in touch with him or the millions who have benefitted from his works to this very day. 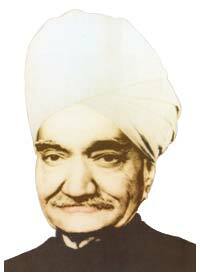 One of his many endeavours was the establishment of the Adarsh banner in the education sector of the country. Dr Bhagat Ram Sahgal was born on 1st January 1900, in a family of humble origin, which ran a local cloth shop in Lahore, now in Pakistan, and sold clothes, imported from England. His father Lala Bal Mukand could not persuade Bhagat after he had completed his matriculation, to stay in the family business as he had interest in pursuing further education and become a doctor by profession. His passion to address public gatherings and a desire to do his bit for the nation, at a time when the whole country was fighting to break the shackles of the British Raj was much appreciated by the then, leaders of the freedom struggle. He was sent to countries like South Africa, and even England to spread the message of universal brotherhood and peace to the Indians living abroad. It was at this juncture that the role of Raja Ram Mohan Roy emerged in the history of India, along with the evolution of the Arya Samaj. Dr Bhagat Ram Sahgal with the support of the local Indians founded the Arya Samaj in East London, U.K., Durban in South Africa and Singapore. So much so, that his statue still remains in the main hall of the office of the Arya Samaj in Singapore and their timely periodicals have his name on the front pages.